The sweet potato (Ipomoea batatas) is a prostrate, trailing, perennial herb, grown as an annual for its enlarged, fleshy roots. (The potato is discussed in "Root Development of Field Crops.") It is a member of the morning-glory family, of tropical origin, and one of the leading crops of southern United States. It is also grown to a considerable extent in the North. It rarely forms seed in the United States and is propagated vegetatively. Methods of propagation are pertinent here since they are concerned with root development. When the plants are set into the field, they are watered like tomato or cabbage transplants if the soil is dry. Frequently, the roots are dipped into a thin paste made of mud and water. This not only, prevents them from drying in the process of planting but also causes the soil to adhere to them. Pressing the soil firmly about the plantlets to establish a good contact is essential. The plants are sometimes propagated by root cuttings placed directly in the field. Sweet-potato plants of the Yellow Jersey variety were transplanted into the garden on June 1. The plants were set 15 inches apart in rows 4 feet distant. Early Growth.--At the time of the first root excavation, 23 days later, plants of average size had 30 to 35 leaves with blades that varied from 1 to 2.5 inches in length and width. Many branches had grown from the original root cuttings. A typical case will be described. The transplanted root, which was 4 millimeters thick and 5 inches long, gave rise to 71 branches. These originated rather uniformly throughout, beginning just beneath the surface of the soil. Their general course was outward and downward, nearly all running obliquely at angles of 45 degrees or less from the old root (Fig. 68). Many were only about 1 inch long; others reached a maximum spread of 4 inches and a depth of 17 inches. This depth was not exceeded by. roots which penetrated rather vertically downward from their origin near the base of the cutting. None of these fine, rather tough, glistening white roots were more than 1 millimeter in diameter, even at their origin, and they were usually much less. When injured they exuded a white sap. Laterals were fairly abundant, about six per inch, thread-like but rather firm. They grew at right angles from the main roots. Usually they were unbranched, but a few of the longest had the beginnings of branchlets. The whole rapidly growing root system, because of its light color, stood out in striking contrast to the dark soil. The long, glistening white, unbranched root ends were very characteristic. Fig. 68.--Root system produced from a root cutting of the Yellow Jersey sweet potato 23 days after transplanting it into the field. Midsummer Growth.--One month later, July 25, root development was again investigated. Typical specimens now had 12 to 19 prostrate branches varying in length between 1 and 4.5 feet. Frequently, there were about 8 of the longer ones. In addition some new vines less than 1 foot long were found. The older, basal leaf blades were 2.5 by 3 inches in size; the younger ones near the ends of the branches were about half as large. Some of the vines, were rebranched. As many as 400 to 450 leaves were found on individual plants, thus presenting a rather large transpiring and food-making surface. A thorough study of the underground parts showed that they had developed in proportion to the tops. The roots ramified the soil 2 to 3 feet on all sides of the plant and penetrated to a working level of 2.6 feet. A maximum depth of 41 inches had been attained. A study of Fig. 69 gives a fair idea of root development and distribution. Fig. 69.--Development of sweet-potato root system on July 25. It is 1 month older than shown in Fig. 68. Each plant had 12 to 16 large roots 1.5 to 4 millimeters in diameter and many smaller ones, all of which originated from the transplanted cutting. Some of the larger roots had become quite fleshy (diameter 0.2 to 0.5 inch) throughout 2 to 4 inches of their course. In the surface inch of soil there arose numerous horizontal laterals only about 1 inch long and entirely unbranched. Others ran horizontally or nearly so 2 or more feet, branching freely but ending in the surface 6 to 8 inches of soil. Still others ran obliquely outward and downward in such a manner that when they reached a lateral spread of 1.5 to 2.5 feet they were still within the surface foot. These roots frequently gave rise to numerous, long, vertically penetrating branches which reached depths of 2 to 2.5 feet. For example, one main lateral, which finally ended at a depth of 21 inches but 40 inches horizontally from the base of the plant, gave rise to 11 roots of this type. Still other main roots turned more obliquely downward, some descending almost vertically and filled the soil beneath the hill. They branched widely and ended near the working level. Some of the large laterals from these more vertical roots spread obliquely in the deeper soil and ended, but more usually turned downward, 6 to 17 inches horizontally from their origin. The usual spreading of branches, whether vertical, horizontal, or intermediate, at wide angles (often at right angles) with the branch from which they originated is characteristic. Branching of the laterals was very similar throughout. An average rate of 3 to 8 branches per inch was determined. There were seldom fewer than 2 and sometimes as many as 12. Length of branches was more variable. Those that clothed the longer roots, whether of the first or second or sometimes the third order , usually ranged between 0.2 and 2 inches in length. Longer or shorter ones were much less frequent. These laterals were only rarely rebranched. As shown in the figure, however, the soil was well filled with roots. Both tops and roots were growing vigorously. This was clearly revealed underground by the glistening white root ends, the last 2 inches of which were usually unbranched. Mature Plants.--A final examination of the root habit was made on Oct. 3. The vines had made an extensive growth, frequently 12 occurring on a single plant. Many of them had a length of 14 feet and gave rise to 175 leaves. Since the leaf blades were approximately 3.5 inches in length and width, a very extensive transpiring surface was presented. The average spread of a single vine was about 20 inches and an individual plant covered nearly 200 square feet of soil surface. There were about 12 "potatoes" per hill, the largest being 2 inches thick and 5 inches long. Most of these fleshy roots extended downward rather obliquely and were usually found in the surface 6 to 9 inches of soil. More than 1 foot of the large roots extending beyond the swollen portion was also yellow in color. The thick root cutting to which these "potatoes" were attached was only 3 inches long. It gave rise to 8 to 15 absorbing roots that extended outward rather horizontally. Many of the roots that extended downward from the root cutting were dry in the hard, fissured soil layer which occurred at a depth of 21 inches. They penetrated far beyond this depth, however, usually to the 4-foot level. These roots were furnished with laterals at the rate of 3 to 5 per inch, some of which extended outward 2.5 feet. The fleshy portion of the roots gave rise to three to eight roots per inch. These were 8 to 12 inches long, pursued an almost horizontal course, and were rebranched at the rate of three to six short branches per inch. In addition about three large laterals 3 millimeters in diameter arose from each "potato." These usually extended horizontally 1 to 1.5 feet and then, turning downward, reached depths of 4 feet or more. The main roots, of which the "potatoes" were the enlarged parts, were 3 to 4 millimeters in diameter. They usually extended downward. But at the base of nearly all' of the "potatoes" one or two large horizontal laterals also arose. These ran rather horizontally 10 to 18 inches and then penetrated downward to 4 feet or more. Branching on these roots and on the main roots was very similar. Most of the branches were 1 to 6 inches long and furnished with short laterals. On the main roots, in addition to a few short rootlets, to a depth of 2.5 feet, there were one or two roots per inch that extended almost horizontally 6 to 8 inches and then ran downward to about 3 feet. These were rebranched at the rate of three to five short branches per inch. Between dept hs of 2 to 3 feet the branches on the roots were more sparse and usually partly dried. These occurred at the rate of two to four per inch, being quite unbranched and only 1 to 2 inches long. But below the 3-foot level, where the soil was more moist, the branches were more numerous, longer, and in good condition. The maximum depth of penetration was 69 inches; the working depth 51 inches. In addition to the roots described the stems gave rise at their nodes, and sometimes on the internodes, to an enormous number of roots. As many as 10 to 15, usually in 2 rows, arose from a single node, and there were 3 or 4 such clumps per foot of stem. Not infrequently a node would give rise to a single root. 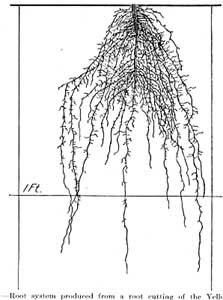 These single roots were profusely furnished with laterals, 1 to 1.5 feet long, which ran mostly horizontally, were rebranched to the third order, and formed a very intricate root network. These main roots were usually only 1 millimeter in diameter but many were swollen to 5 times this thickness for a distance of 3 to 6 inches. Most of them extended almost vertically downward but some ran obliquely outward several inches and then turned downward in their course. A working depth of 40 inches was ascertained although some were found 10 inches deeper. The roots which arose in clumps were very profusely branched in the surface 6 to 8 inches of soil. As many as 12 to 18 branches per inch were common. They extended horizontally 2 to 10 inches. Those that exceeded 1 inch in length were rebranched at a similar rate with rebranched rootlets 1 to 2 inches long. In fact, the soil was literally filled with the profuse network of these adventitious roots and their numerous branches. Undoubtedly they were carrying on much of the absorption for the plants. This was indicated by their fresh color and more turgid condition when compared with the main root system. The most striking character about the root system of the sweet potato is the intricate network of roots that underlies all of the stems and leaves. This undoubtedly promotes the rapid growth and wide spreading of the stems since the source of water and nutrient supply is not far removed from the leaves. Summary.--The sweet potato is propagated vegetatively by slips developed from root cuttings, by cuttings made from the ends of vines, and sometimes by root cuttings themselves. Plants grown by the last method rapidly develop an extensive fibrous root system. Three weeks after transplanting, roots are abundant from the soil surface to a depth of 17 inches. Nearly all run obliquely downward, the lateral spread not exceeding 4 inches. A month later the vines are 1 to 4.5 feet long. The roots extend from just beneath the soil surface to a working depth of 2.6 feet. Laterally, they run 2 to 3 feet. They are well branched throughout. Mature plants have vines 14 feet in length. In addition to about 12 fleshy roots per plant, the attenuated portions of which branched widely and penetrated deeply, there are usually an equal number of extensive roots of small diameter. These penetrate far outward and downward, mostly to a depth of 4 feet. Long sublaterals are common and shorter branches very profuse. 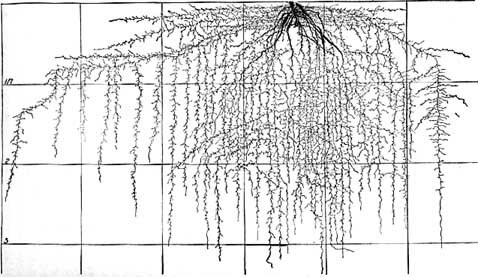 A network of roots ramifies the soil from its surface to a depth of 51 inches. Abundant, profusely branched roots arising from the nodes of the vines penetrate deeply and add materially to the absorbing area. Thus the soil under the widely spreading vines is completely filled with a dense, absorbing network of roots. The root habits of the wild ancestors of cultivated plants, so far as the plants are known, would make an interesting and valuable study. The object sought in cultivating plants is usually to produce a growth of some of their parts, whether flower, seed, fruit, leaves, stem, or root, that is unnatural to the species in its native habitat. Undoubtedly in so doing other parts of the plant are also greatly modified. The modern varieties of vegetable crops have become accustomed to growing in soil especially prepared and liberally supplied with everything the roots need. In fact, the plants are unable to fully develop in soils of moderate fertility. Surely this has brought about great, changes in the root habit. Root Habit in Relation to Cultural Practice.--A number of interesting and important root relations are concerned with the growing of sweet potatoes as a result of the cultural condition imposed upon this plant of wild ancestry. Fresh manure causes a rank growth of vines and the development of large, rough roots. Water Relations.--It has been observed in New Mexico that if sweet potatoes are kept well irrigated and the surface soil moist, a larger crop is produced and the "tubers" are nearer the surface of the ground than where the soil is allowed to become too dry. In the latter case, the roots tend to grow deeper in the soil. There is a development of the root system, seemingly at the expense of the crop and the "tubers" are found quite deep in the soil. 37 This, of course, increases the difficulty and expense of securing them and they are much more apt to be bruised in the process, thus increasing subsequent losses from decay. The plant roots so deeply and extensively that, once the roots are well established throughout the soil, it endures drought much better than most vegetable crops. In fact, it will produce a fair crop in semiarid regions where most vegetable crops will not thrive at all. Under irrigation in California good growth and yields have been observed where by midsummer there was no available soil moisture nearer than 20 to 24 inches from the soil surface. 122 The roots, however, are intolerant of poor aeration resulting from a wet soil. Hence the common practice of setting the plants on ridges often 8 to 15 inches high. 122, 143, 178 The ridges should be as low and flat as the drainage conditions will permit for the higher and narrower the ridges the more rapidly water is lost. The effectiveness of this method, of course, depends upon the season, but experimental evidence shows that the yields are often increased. Spacing of the plants seems to be determined in practice largely by the spreading of the aboveground parts and the case of cultivation. To afford room for the widely spreading vines, the plants are widely spaced. A planting distance of 12 to 18 inches apart in rows 3 to 6 feet distant is usual. Under these conditions root interlacing occurs to a marked degree and the soil is thoroughly occupied. Summary.--The root habits of sweet potatoes are closely related to cultural practice in many ways. Chief among these are the selection of the proper kind of soil and its thorough preparation before the plants are set; the effects of the application of fertilizers and water of irrigation upon the root habit; the relation of the roots to drought and soil aeration; manner and time of cultivation in relation to the root system and the rooting of the vines; the effect of pruning the stems on root development; spacing of the plants in the field; and, finally, physical and chemical activities of the root in relation to time of harvesting.